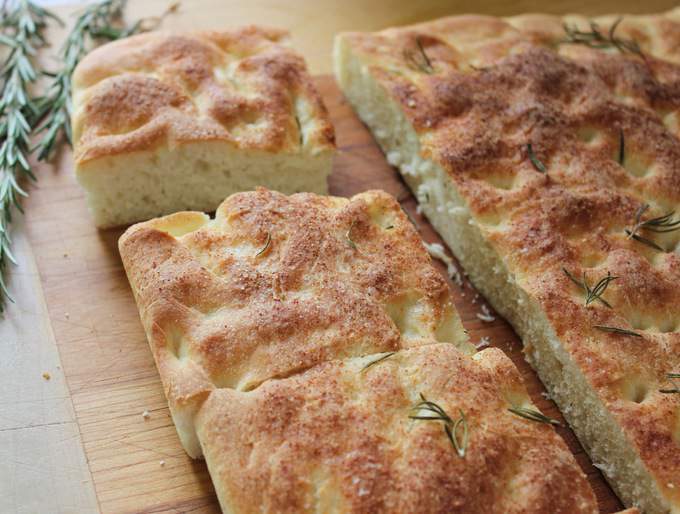 I tried quite a few recipes for Focaccia before landing on this one. Some were to thin, too dry, too thick…this one is perfect! It could be because you cook it in a small pool of olive oil and who wouldn’t like that? The extra oil in the pan makes a crusty bread and the olive oil adds a deep flavor but it does not taste oily at all. The original recipe is from Ann Burrell, (funky, spikey blonde hair lady on Food TV) I’ve been told if I would sprout about 3-4 inches, I would be a an Anne Burrell look alike…I would be okay with that! I used a Kitchen Aid and dough hook, but you could certainly just go in with your hands. Give it a long first knead though, you want it smooth and silky. In the bowl of a mixer fitted with a dough hook, combine the flour, 1 tablespoon of kosher salt, 1/2 cup olive oil and chopped rosemary. Add the yeast mixture on low speed. Once the dough has come together, continue to knead for 5 to 6 minutes on a medium speed until it becomes smooth and soft. Give it a sprinkle of flour if the dough is really sticky and tacky. Coat a jelly roll pan with the remaining 1/3 cup olive oil. (Chef’s Note: This may seem excessive, but focaccia is an oily crusted bread. This is why it is soooooooooo delicious!). Liberally sprinkle the top of the focaccia with some coarse sea salt and fresh Rosemary, lightly drizzle a little oil on top. Bake the dough until the top of the loaf is golden brown, about 25 to 30 minutes. 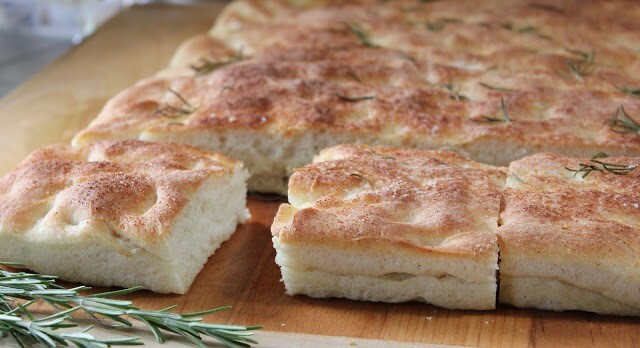 Remove the focaccia from the oven and let it cool before cutting and serving. Yum!! I like to make Focaccia in the summer time and put the dough in a large zip lock bag and set it outside to rise!! !